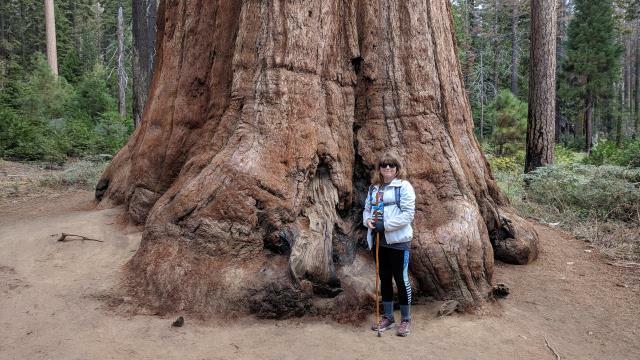 Mariposa Grove has undergone an extensive renovation that focuses on people walking among the Sequoia giants instead of visitors idling in their cars as they drive through. Gone are the car choked roads and stand-still traffic. Now there are footpaths and boardwalks where people can stop and enjoy the sights at their leisure. An ample parking area now exists just off of Wawona Road a short distance from the South Entrance of the park. Shuttle buses will transport visitors from the parking area uphill to Mariposa Grove. 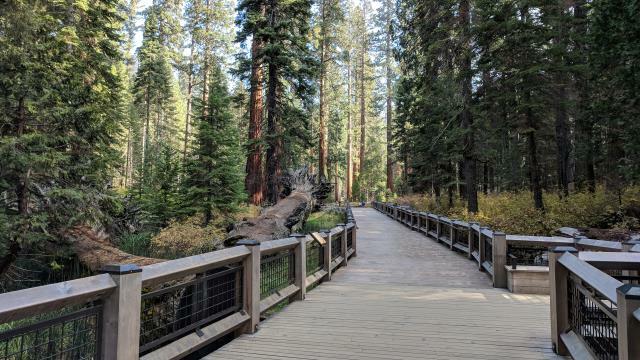 The Mariposa Grove boardwalk is well done and makes for easy access to part of the trail. The Fallen Monarch can be seen parallel to the boardwalk on the left. The shuttle buses stop adjacent to a nicely designed trailhead area that includes numerous interpretive signs. The main trail starts straight ahead on the wide boardwalk. The trail roughly follows the path of a creek and so the terrain at the start is relatively flat and easily navigable by almost all walkers and is probably ADA compliant. One is presented with numerous Giant Sequoias right from the start. Though not as numerous here, the Sequoias are more approachable in the second half of the loop. Once the trail gets to the Fallen Monarch, a Sequoia that had fallen many years ago, the terrain gets slightly rougher, but still quite easy. The boardwalk eventually gives way to a packed dirt trail. The Grizzly Giant is one of the more famous trees you'll see anywhere. It is one of the largest trees (by volume) in the world. The California Tunnel Tree marks an option for the hiker to choose their hike length. Going through, yes we mean through, the California Tunnel Tree means continuing uphill towards larger groves of Sequoias and steeper terrain. Turning left at the California Tunnel Tree results in a rough loop that heads back to the trailhead. The trail here is easy enough to follow but there are no interpretive signs or trail boundary markers. There's also a bit of elevation gain before descending back to the starting point. The trail here passes much closer to a few Sequoias, allowing one to more appreciate the trees' immensity. Beware of crowds at Mariposa Grove. It's one of the most popular spots for visitors. For more quiet and solitude pick an early morning hike and/or a bit off peak summer travel season. Mariposa Grove is one of the most popular trails in the park. Coppertone and I got there early enough to walk the paths in relative solitude, one of the benefits from staying in nearby Fish Camp. But it was not too long before busload after busload of visitors arrived to fill up the paths. A large group of schoolkids pierced the earlier quietness with shreeks and hollars. The Sequoia grove has undergone an extensive transformation recently with car choked roads of cars replaced with boardwalk trails and lots of informational signage. We never visited the area prior to the transformation, but we're convinced that things must have been improved dramatically. We overheard the radio of park employee yesterday that reported a bear sighting at the grove, but we saw no sign of it today. We kept our hike short here both due to threatening rain that never fell, but also due to tired legs from our hike to Vernal and Nevada Falls yesterday. We did the Grizzly Giant Loop Trail which provided us views of several of the important named trees in the grove included the California Tunnel Tree and the imposing Grizzly Giant. The start of the trail from the trailhead is a boardwalk path (almost certainly ADA compliant) studded with information signage. Once the trail gets to the Fallen Monarch conditions get slightly more difficult with a bit of elevation gain, but nothing in this loop would be considered challenging.By the time the trail gets to some of the other named trees the path is well worn compacted dirt. After the California Tunnel Tree the trail becomes far less regimented. Up to that point the trail is boardwalk with railings or a well marked path with barriers on either side keeping people on the trail. The rest of the loop is easy to follow, but the "guard rails" are all gone. Thankfully people staid on the trail anyway, but the lack of barriers does mean you get a bit closer to the Sequoias than in earlier segments.